One of the latest cities to hop on the micro-apartment bandwagon is the British Columbia city of Surrey. 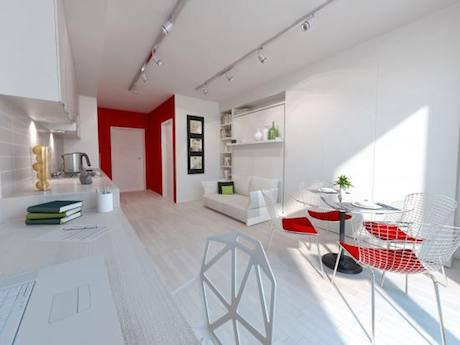 A new development called Balance will offer 56 micro-apartments measuring 290 square feet. Unlike similar developments that are rental only, Balance units will be for sale starting at C$109,000. According to developer Charan Sethi, president of the develop company Tien Sher, this price point makes purchasing one of the apartments within the reach of someone making $17/hour. With their 9′ ceilings and large windows, the apartments appear clean and airy with nice finishes and details (admittedly, only renderings and an offsite demo apartment are available to look at). There are a number of extras the developers offer such as a custom wall bed with couch (it’s a Resource Furniture Penelope model so far as we can tell), combo washer/dryer units, a workstation and so on. No word on how much these extras cost. Their site doesn’t say when the condos will be available, but they are doing pre-sales. Vancouver has some of the highest property values in North America and Surrey is a member municipality of Metro Vancouver. But Surrey is no Vancouver. Surrey’s density is 3,800 people/mile versus Vancouver’s 13,600. And their property values reflect this spaciousness. We did a cursory search of Surrey real estate in the area of Balance and the prices of studios and one bedrooms started around C$150K+, but their sizes were also much larger (600+ sq ft), making Balance’s cost/sq ft considerably higher than market. Balance is an interesting new breed of micro-apartment. Whereas the majority of developments have been centered on high-density, high-cost areas like Vancouver, Balance has the high-density-appropriate architecture but in a low density, low-to-moderate cost area. Similar developments are showing up in Chicago and even Iowa. Balance also bucks the trend by offering sales of its units. Micro-apartments lend themselves to rentals as their tenants seem more likely to be transient and value the ability to jump ship or upgrade to larger space when the time comes. What the developers of Balance are banking on is that people will choose smaller, rather than having it imposed upon them. Sethi says as much in an interview with CTV: That these apartments are for people who are fresh out of school or who travel a lot. He believes there are many people like that who just want a nice, clean space and the small size is an advantage as it’s less to deal with and less to buy. The building is also in close proximity to a main metro line for easy access to Vancouver. What do you think? 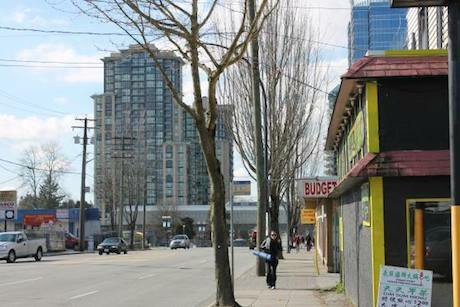 Will people choose to pare down in areas where affordable, larger housing is available? And would anyone buy one of these apartments? Or is this all wishful thinking from developers trying to pack more people in a plot of land and get their money back? Let us know below in our comments section. Yes we would live small. We built a small house for ourselves and still do not use some of it. Small is smart!!! Live below your means and you will have a rich life. The results to this micro survey will definitely be flawed. I know I would choose to live small, but most people searching or reading this article feel the same way. Truth is if you show someone two apartments it comes down to $/sqft. If someone can get more space for less, they will. If there was a way to get everyone to watch Graham’s TED talk it’s possible to get people to understand that things don’t equal happiness. If there was an inexpensive version of these apartments without custom, top of the line appliances, I believe they would be much more successful in the general public. The small house movement seems always to ignore seniors. We seniors are the ultimate downsizers. Given that such a large chunk of retirees are single (women) living alone, I would think there’s a solid untapped market. I happen to be in the process of building a McMansion: 650 s.f. – in Mexico! Many retirees I know are hip to the small-is-better scene and have been for decades. it’s a topic that’s very much on our minds. with more baby boomers retiring, there is going to be a massive need for manageable housing. we will definitely be posting about retirees in the future. Forgot to mention; also retired on a fixed income. I choose small but I currently live in 800 sq ft and consider that in the small, but not micro category. I’d like to downsize in the future so that I could fit myself comfortably into a micro space if and when I need to move (that won’t be for many years as I live attached to my parent’s home). While I could afford bigger, I’m hooked on small space living. I’ll go smaller but not bigger. These renderings look great but yes the Resource furniture isn’t cheap although well worth it. I think it’s so great how you can get a nice condo that is perfect for your needs. They have some great pricing options too. I’d rather get one of the smaller surrey condos and owe less. You have to buy within your means.